Add a little New Mexican ambience to your home. 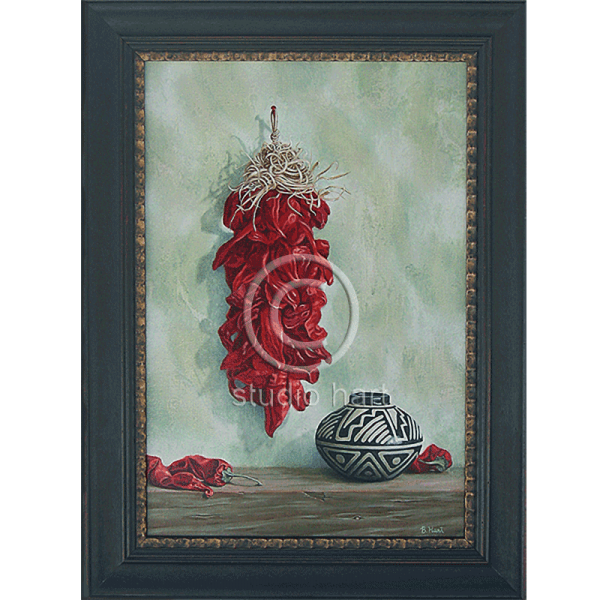 For years I was in a Santa Fe gallery and created a series of paintings with chilis. At the same time, I continued to import Peruvian handicrafts. You’ll see artifacts from Peru in most of my southwestern paintings, because they really blend nicely. This one features a clay pot made by Shibipo women. Materials: Original oil on linen, mounted on birch board. Black wooden frame with rubbed gold highlights.